Don't get so excited with eBay prices that you pay more than the price of a new tool! The current MSRP of the Shopsmith Mark V Lathe Duplicator is $461.99. Most folks don't know that there have been two models of the SS Lathe Duplicator; The first version used Uni-Strut for the horizontal template support on the top of the unit, like the one in the photo at right. A few years back SS made an improvement to the unit by incorporating a custom extruded aluminum "I-Beam" member, that made adjustments and fine tuning a breeze! This later version is the one I would buy. This unit was designed to fit the Mark I, Mark II, Mark V Model 500, 505, 510 and 520. I used this great accessory to turn about a hundred custom rosettes for a "This Old House" type show in Dayton called "The House on North Main Street" and it worked like a champ! 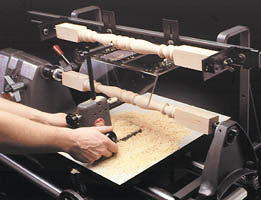 Another video of the Shopsmith Lathe Duplicator being used for freehand turning.